In 1945 a general strike involving tens of thousands of workers began with railway workers, then spread to other nationalised industries including dock and civil service workers, with workers at private firms supporting the strike and refusing to cross picket lines. Estimates of involvement range between 42,000 to 200,000 workers making it one of the largest strikes in colonial Africa up until that point. Nigeria was amalgamated into one country in 1914. However, the consciousness of it being a country amongst the people was forged in 1945 when the entire populace responded to the first general strike in 1945. It was also a strike that struck the most devastating blow against colonialism in the country. The events that led to this started with a February 10 meeting by representatives of technical workers. That meeting set up a Joint Executive of Government Technical Workers. On March 22, this body sent a letter to the colonial regime demanding a two shillings, six pence minimum wage and a 50 per cent increase in the Cost of Living Allowance (COLA) back-dated to April 1, 1944. The workers’ communiqué said that “…the situation can no longer be sustained.” It gave a one month ultimatum emphasizing that “not later than Thursday, June 21, 1945, the workers of Nigeria shall proceed to seek their own remedy with due regard to law and order on the one hand and starvation on the other” unless their demands are met.
. They all signed a resolution endorsing the ultimatum for an all round COLA increase made by the Technical Workers. On May 30, 1945 the colonialists met a delegation of the workers led by their President, T.A. Bankole. J.O. Erinle, A. Abosede and J. M. Osindero were on the delegation. Three days after this letter was sent, the African LOCO Drivers Union placed their management on strike notice with effect from the midnight of June 21. The Railway workers followed with their own notice. On June 16, 1945, a mass meeting of about 8,000 workers was held to consider the Government’s June 11,1945 letter. The meeting reiterated the strike ultimatum while leaving a window open for possible negotiations. That same day, the TUCN leadership held its regular consultative meeting with the Labour Department. The Commissioner of Labour told the TUCN leaders that the strike ultimatum had not followed laid down procedures which requires a formal report to the colonial governor who has 21 days within which to act. The leaders agreed with him and went about convincing the unions to shelve the strike action. A meeting attended by 300 delegates was held that same day to deliberate on shelving the strike. While the Joint Executives of the Workers favoured a postponement, some, like the African LOCO Drivers union president, F. Modupe Alade not only rejected it but also asked their national leader, A. T. Bankole to step aside. Apparently, the strike leaders had misread the mood of the workers; a postponement was the last thing on workers’ minds. That same day, a mass meeting of the Railway Workers Union met at which the leaders of the labour centre; TUCN and the Joint Executive of the workers explained why the strike was being postponed. They underestimated the powers of Imoudu who was wearing a war dress. He told the meeting that negotiations had failed, so the strike must go on as scheduled. After this, the workers got up and sang for the strike. This was the beginning of Imoudu’s sack of the TUCN leadership as the general strike took off. On June 21, the day the ultimatum expired, a mass meeting of workers held from 5.30 p.m. at the St. Peter’s School, Lagos. The workers decided to commence the strike action from midnight. They also passed a resolution ordering their leaders to resign. The leaders subsequently resigned enmasse. During the meeting, the traditional ruler of Lagos, Oba Falolu arrived to persuade workers against the strike, he was forced to leave due to workers hostilities. The Amalgamated Union of Mercantile Workers held their mass meeting that same evening and decided to go on strike immediately. The general strike took off on June 22 and went on for 45 days. They were days that shook the colonial administration to its foundations. The whole society was involved either in aid of the strikers or sometimes to sabotage it on behalf of colonialism. While many nationalists led by Herbert Macaulay, Azikiwe, Madam Adunni Oluwole and Obafemi Awolowo supported the strike, some particularly those of the Nigeria Youth Movement tried to sabotage it. 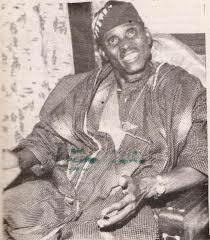 Historian, Mokwugo Okoye wrote: “After two weeks of the strike, a committee of gentlemen comprising Dr. Akinola Maja, Dr. K. A. Abayomi, S. L. Akintola and other leaders of the NYM were hired by the government to cajole the strikers back to work; but the men would not budge an inch without definite guarantees which of course the quixotic emissaries could not give, if they ever thought of the matter before hand. Troop movements were frequent and every artifice was tried by the government to break the workers morale, but these failed.” The media was a study in contrast. The Daily Service, the NYM’s newspaper in its support of the colonial authorities not only tried to rubbish the strike but went to the quite unprofessional extent of omitting any mention of lmoudu’s role in the strike.